Project: UC Med Center, Sacramento, Ca. At UC Davis Medical Center Surgical and Emergency Services Pavilion cardiovascular surgery is performed in an 8-room pod of Operating Rooms that has convenient access to the tissue bank and the other surgical support functions that are arrayed around the perimeter of the OR pods. When a leading vascular surgeon was recruited to the facility, one OR in the cardio pod was upgraded with ceiling mounted Phillips single plane flouroscopic camera, to allow intra-operative catheterization. The room is now used for both peripheral angiography and cardiovascular surgery. The surgeon in the photo is the lead vascular surgeon, Dr. David Dawson, wearing a lead vest to protect himself from X-Ray exposure. 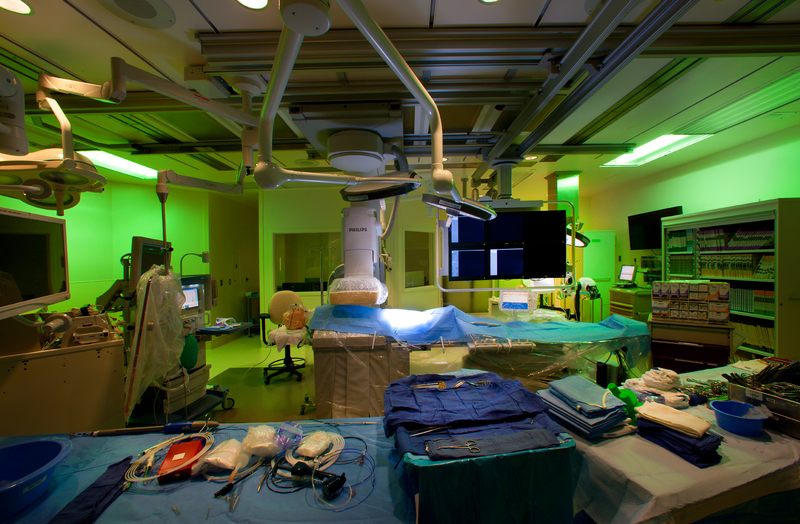 Green lighting is available to increase visual contrast for the surgical team. The OR selected for this upgrade, here shown fully equipped for a procedure, is near an express elevator connecting the OR pods to the Emergency Department and Trauma on the First Floor. The new Emergency Department and Trauma on the First Floor; this allows patients experiencing such critical emergencies as stroke, a clot in the carotid artery, or deep vein thrombosis to be rushed directly to this advanced surgery suite.